Alberta Tourism, Parks and Recreation is looking for feedback on a proposal to exchange land adjacent to Dead Man’s Flats with public lands, nearby and in the Ghost and Waiparous areas, to allow for better protection of the wildlife corridor between Dead Man’s Flats and the Bow River. The MD of Bighorn would receive lands that have been previously disturbed and are deemed to be of less ecological value. Some land will be removed from the Wildland Park. This land is predominantly an old gravel pit near the junction of Highway 1A and Highway 1X. The site was part of the previous Yamnuska Natural Area and historically functioned as a staging area for alpine and orienteering activities. It has not been used for some time. The Yamnuska parking area is now the access to this section of Bow Valley Wildland Provincial Park. Send in your comments, suggestions and concerns by November 29, 2010. The latest on the ASP on the subject lands. Timely and interesting item on Canmore’s local radio this week on the exact topic. Go to this link and listen to the 3rd item about the cougar closure currently in place. 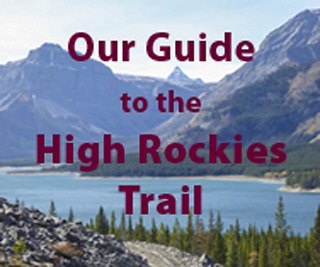 And unrelated: listen to the 4th item, too, about illegal trails, and how the Friends of Kananaskis help. Pretty sure the MD doesn’t care what anyone in DMF or Canmore wants. The public comments when the swap was still on the table were generally in favour of the swap. The land the MD wanted was smaller than the DMF land and already disturbed, being a portion of an old borrow pit and storage area. And there’s no one who doesn’t think the DMF land should be put into the park. But the MD will not give up developable land for undevelopable land. The MD thinks the Government values that DMF land for a wildlife corridor, and they need to “pay” for that somehow. Ah thanks for the information. I am not sure why the MD must have the bit of Yamnuska in order to protect the DMF land given that nobody in DMF is in favor of development. Dead in the water, which had bad ramifications which are still ongoing. In short, they took public comments, then it sat on the Minister’s desk. Then the Minister decided they didn’t want to give up 1 square inch of park space, so they said no, try again MD, and the land swap was nixed. The MD turned around and re-subdivided DMF, and the swap parcels in question became subject to an ASP. They commissioned a study from McElhanney who looked at best uses. The MD decided that the land along the river should be turned into playing fields and ball diamonds, and the land next to the wildlife underpass should become an extension of the River’s Bend industrial park. They held open houses and everyone hated it — not one positive comment, even from River’s Bend. So of course, the MD voted in favour of it, and sent it to the next level, a public hearing. At the ASP public hearing, the Town of Canmore was so mad that Borrowman threatened the MD with legal action if they proceeded. The MD laughed because not one DMF resident came to the hearing, which the MD took to mean that they were in favour. The MD then commissioned a study from Golder who said all they had to do was fence the place and everything would be fine. And so it sits. The MD has 2 years to approve the ASP. There was hope that the government change would result in more openness to a land swap, but it turns out the NDP won’t give up parkland either. There was a belief that the MD was just leveraging the government to get the land they wanted. They can’t. Understand: the MD has a rapidly decaying tax base. Shell is closing the Burnt Timber plant, which currently generates 1/3rd of the MD’s revenue. The MD intends to develop every square inch of land it has, wildlife be damned, and none of the land the Government has ever offered for the swap was developable. OK so so many years later I have two questions. a. What exactly was the area covered by the land exchange proposal. Was it the entire Natural Area or just the borrow pit. b. What happened anyway? I tried to look it up on the government parks website but I couldn’t figure it out. As a resident of Dead Man’s Flats, it would be helpful to remind folks that the intersection of 1A and 1X is nowhere near DMF, though the government’s FAQ on the matter says it is. This land swap should be looked at in conjunction with the plans the MD has for DMF, including the construction of a water plant, waste transfer facility, and sewage treatment plant next to the wildlife underpass, plus the River’s Bend/BMB/Limestone Valley industrial park that will occupy the lands that are not Crown on the east bank of Pigeon Creek. Of specific interest is that the map indicates that Block 1, Lot 6, which currently contains the sewage treatment lagoons, will revert to the Crown. Meaning they have to clean it up. Transferring the land to the east of DMF into the Park is a great idea. We wander around back there all the time (including last weekend), and it’s very interesting and full of elk. Note, however, that I am aware of at least 4 hunting perches set up permanently in the trees, plus at least one hunting “camp” like place where kills are hung, dressed and apparently smoked, too. I suggest dressing in orange or going on Sunday. Thanks for finding this, Tony. The FAQ says “Focused engagement sessions with local First Nations and local area stakeholders occurred over 2009-10”, and yet the only thing I saw was Subdivision application decisions in February 2009. Obviously the sessions were so focused they did not include DMF residents.